Uggani, Buggani, Vaggani, Borugula Upma and Maramarala Upma are all names of the same dish which is a popular breakfast fare in Rayalaseema region of Andhra which include, Chitoor, Ananthapur, Cuddapah and Kurnool districts. It was a common sight to find road side vendors selling a snack prepared with puffed rice, Uggani with Mirchi Bajji, a typical combination found only in this region. 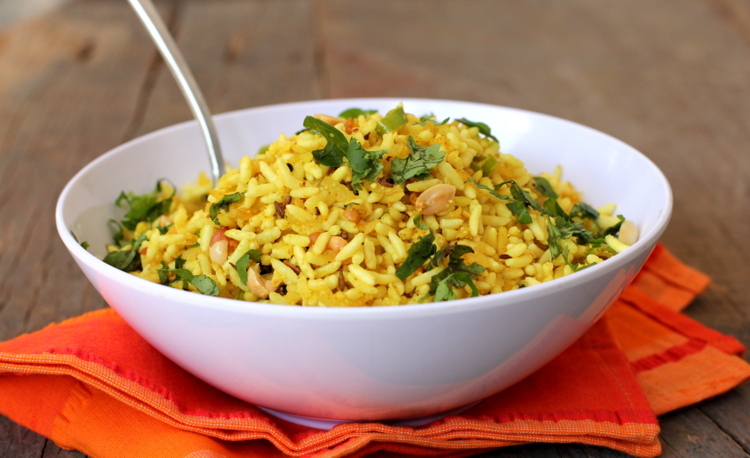 A very basic and simple recipe that has roasted chickpeas and dry coconut as its star players. Each home has its own version, some use tomatoes, a few throw in peanuts for the crunch factor and many omit dry coconut. Whatever the version, Uggani, is a light yet filling dish that is relished by the Rayalaseema folks. I like to make it as an evening snack along side mirchi bajji (green chili fritters) and masala chai on a rainy day. When you have unexpected guests drop by and need to whip up a quick snack, make Uggani and serve it with a cup of hot kadak chai and papad or chips. I would categorize Uggani as one of the simplest yet flavorful snack among South Indian recipes. Take a deep bowl and fill with 4 to 5 liters of water. Add the puffed rice and allow to soak for 3 mts. 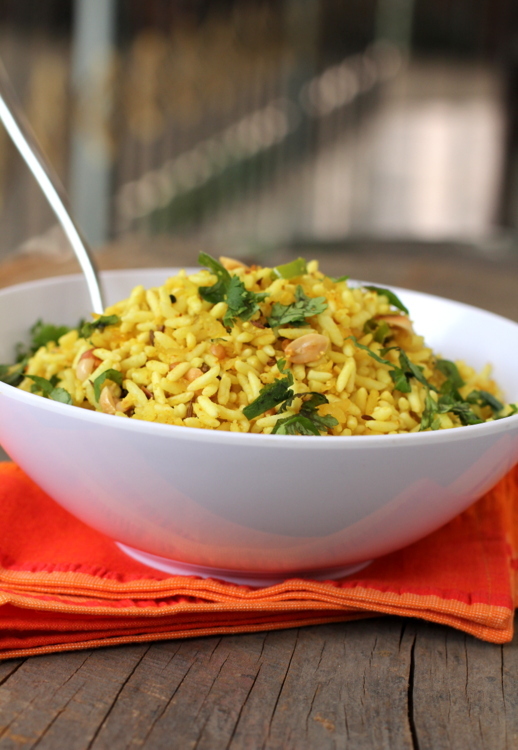 Using your hands, squeeze out water from the puffed rice and place in a bowl. Grind roasted chickpeas and dessicated coconut to a fine powder and keep aside. Heat oil a heavy bottomed vessel, add mustard seeds and allow to splutter. Add cumin seeds, urad dal and saute till the dal turns red. Add curry leaves and green chilis and saute for a few seconds. Add the chopped onions and saute for 6 mts. Add turmeric powder, puffed rice, ground powder and salt and mix well. Toss for a mt. Add lemon juice and roasted peanuts and turn off flame. Garnish with coriander leaves and serve warm with mirchi bajji, papad or pakoras. 1/2" grated ginger can also be added at the time of tempering. Cumin seeds and urad dal are optional ingredients. If you do not have dessicated coconut on hand, omit it. Roasted chickpeas are essential ingredient for this dish. I used to love this growing up and even now, it looks yummy. If u add dalia and red chilli powder and grind it it makes a fine powder ,add this powder to squeezed puffed rice ,it tastes good.Just a suggestion but its upto ur taste. Thank you Sailaja, Immediately after reading this recipe i went into kitchen and made borugula upma for myself. Looks very interesting, shall try. Does this one turn out crispy, as puffed rice chivdas/bhel are? Or does the soaking make it soggy. Its not crispy but will be similar in texture to bhel puri. It does not get too soggy either. My mother does this dish adding with mixed vegetables tastes ???? The recipe is made in Mahaubnagar District of Telangana also.